Papayas are a mildly sweet, soft, greenish/yellow fruit shaped like a large pear, weighing in at about one-to-two pounds. Papayas add versatility to recipes and can be pureed for sweet and savory sauces, soups, or sorbets. Papayas also make for a good protein marinade, as they have an enzyme called papain which breaks down proteins. Papaya is a low calorie containing about 60 calories in one cup. Most of the calories in papaya come from carbohydrate. There are almost 16 grams of carbohydrate in a serving of papaya. The carbs in papaya are a combination of fiber (2.5 grams) and naturally-occurring sugars (about 11 grams). The estimated glycemic load of a one-cup serving of papaya is three. There is almost no fat in papaya, with each serving containing less than one gram. Papayas provide less than one gram of protein per serving. Papaya is rich in vitamin C, providing 144 percent of your daily needs in a one-cup serving. They are also an excellent source of vitamin A and a good source of folate and potassium. The vitamins in papaya provide important health benefits. Vitamin C, a water-soluble vitamin, is responsible for boosting immunity, slowing down aging, and repairing tissues. Vitamin A is critical for good vision and is also involved in immune function, reproduction, and cellular communication. Lastly, papayas contain an antioxidant called zeaxanthin which may help to prevent macular degeneration and aid in eye health. Papayas are also rich in fiber which aids in digestive health, can help pull toxins and cholesterol out of the body and increases satiety. Studies have shown that people who eat adequate amounts of fiber are at decreased risk of developing heart disease and certain cancers. Lastly, papayas might be good for your gut, as they are in an enzyme called papain, that aids in digestion. Their high water content can boost your hydration and help to prevent constipation. 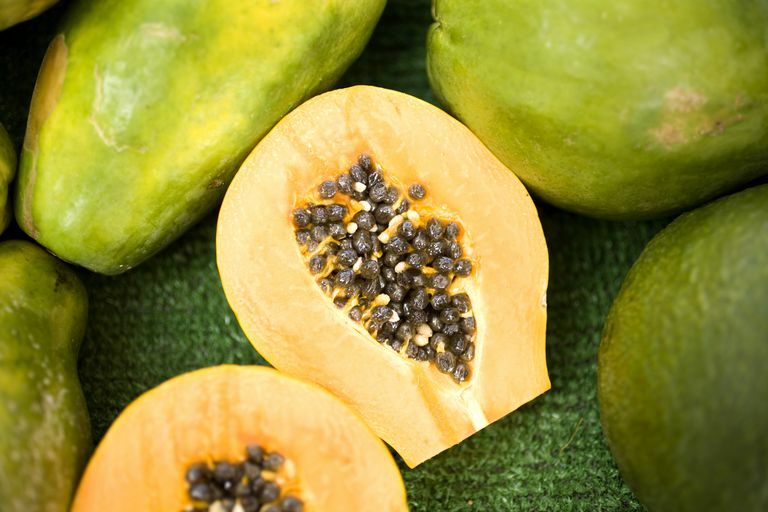 Are the seeds of papayas edible? Yes. The seeds of papaya are edible. They yield a peppery flavor with a slight crunch. They can add flavor to fruit salads or act as a garnish. Papaya has a taste unlike most fruits, with a creamy mouthfeel and a mild flavor. The taste is often compared to that of a melon, but less sweet, and with a softer texture. Sometimes papaya can have a distinct smell, sometimes described as a feet smell, with little to no flavor. Typically this means that the fruit is not ripe. In order to get the full flavor of papaya, it must be very ripe. When are papayas in season? Papayas are available year long with their peak season from April to June. They're grown in warm climates and are most often imported from tropical and subtropical locations. How do I select the best papaya? The best determinant of ripeness is color, not softness. Select papayas that have a greater proportion of yellow to green skin color. The greener the papaya the less ripe it is. Avoid papayas that contain blemishes and choose those that are plump and smooth. What is the best way to store papaya? Papayas can be stored at room temperature until completely ripe and then refrigerated for up to one week. You can incorporate papaya into your meal plan at any time of day. Papayas add flavor and color to your meals while packing in a nutrition punch. Slice papayas and eat them by themselves with a squirt of lemon or lime. Or blend them to make smoothies, sweet and spicy sauces, chilled soups, or protein marinades. Dice papayas and use them in fruit salads, salsas, or compote. Or make a Papaya Yogurt & Walnut Boat: A Tropical Fruit Snack Bowl. An allergy to papaya is possible. Additionally, the American Academy of Allergy, Asthma, and Immunology reports that if you are allergic to mango, pistachio, or cashew you may also have a reaction when exposed to papaya. And a study published in The Journal of Allergy and Clinical Immunology reports that there is an association between allergy to latex and allergy to a variety of fruits, including papaya. If you suspect an allergy to papaya or to one of the other substances noted, speak to your healthcare provider to get a personalized medical diagnosis. Labensky, SR, Hause, AM. On Cooking: A textbook of Culinary Fundamentals. 3rd ed. Upper Sadle River, NJ: Prentice Hall, 2003: 805.